The Billingborough Cemetery is just west of the village on the Birthorpe Road. The Billingborough Cemetery is not mentioned in Directories prior to 1930. 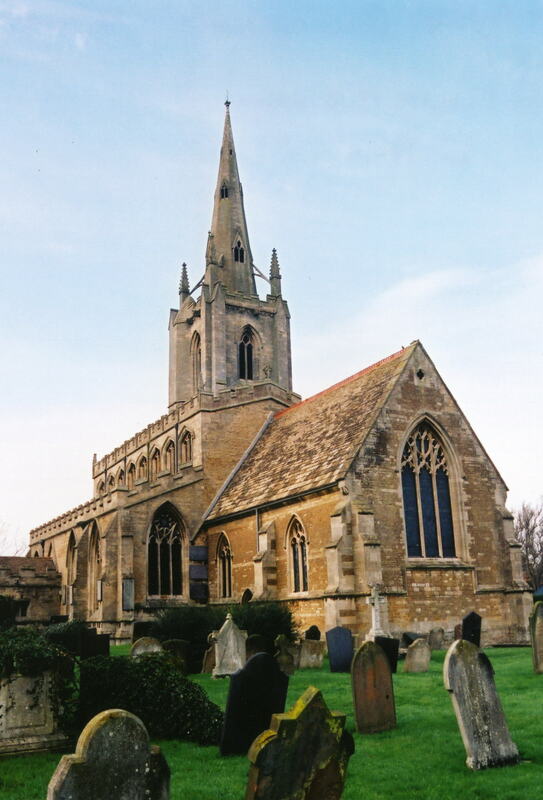 You can also perform a more selective search for churches in the Billingborough area or see them printed on a map. The church is believed to have some Saxon portions, but most of the building dates from 1312. The chancel was rebuilt in 1891. The church has a spire 150 feet tall. 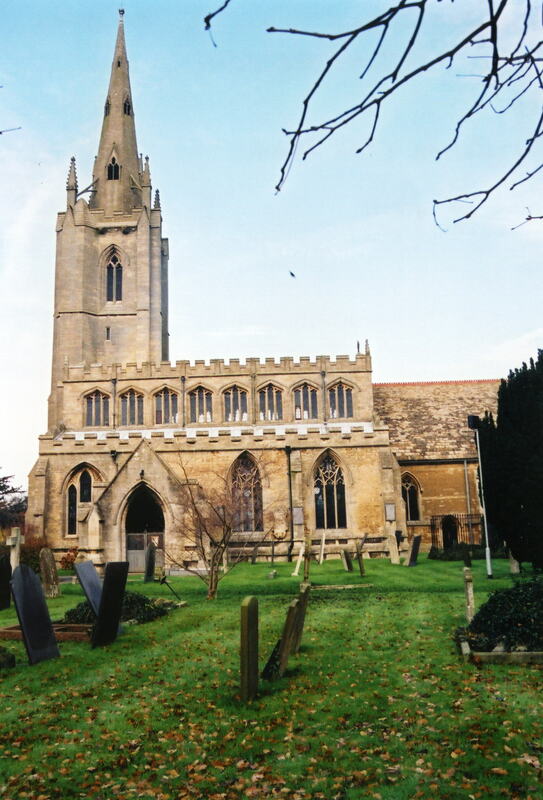 There is a photograph of St. Andrew's Church on the Wendy PARKINSON web site under her "Still more Lincolnshire churches". Richard CROFT has a photograph of St. Andrew's Church on Geo-graph, taken in 2007. Peter LANGSDALE has a photograph of St. Andrew's interior on Geo-graph, taken in February, 2004. We have a handful of entries in our parish register extract. Your additions to this are welcome. If you are a PICKWORTH or GOULD researcher, you'll enjoy our quadruplets report. The Lincolnshire FHS has published several marriage indexes and a burial index for the Aveland and Ness Deanery to make your search easier. The Calvanistic Baptist Chapel was built in 1786. The Wesleyan Methodist Chapel was built in 1829 and rebuilt in 1906. In addition, there was another Baptist chapel in the parish. The Primitive Methodists built their's in 1868. Another Primitive Methodist chapel followed in 1902. For more on researching these chapel records, see our non-conformist religions page. 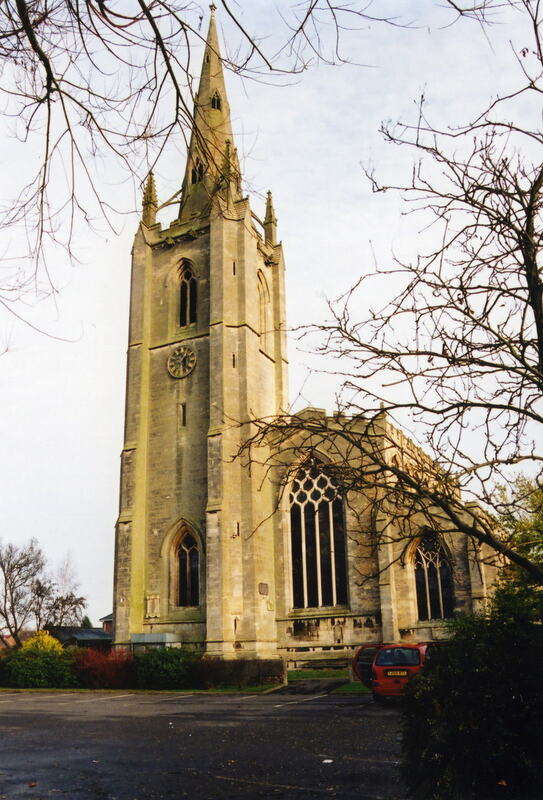 Billingborough is both a large village and a parish 104 miles north of London and 9 miles NNE of Bourne. The B1177 road passes through the centre of the parish. Horbling parish lies to the north. The South Forty Foot Drain completes the eastern border. The old Car Dyke passes just east of the village. The parish encompasses about 2,200 acres. For the visitor with a little time to spare, there's nothing like a visit to Hansens Handmade Chocolates on the High Street. By automobile, take the A52 trunk road between Grantham and Boston and turn south onto the B1177 arterial. Pass through Horbling and the next village is Billingborough. Ask for a calculation of the distance from Billingborough to another place. You can see the administrative areas in which Billingborough has been placed at times in the past. Select one to see a link to a map of that particular area. The Billingborough and Horbling Gas Works were erected here in 1864. A Public Hall was erected here in 1865, built of red brick with stone dressings. The Hall could hold 400. The village hosted a County Police Station in 1900. Robert CARTER was the sergeant. J. THOMAS has a photograph of the 17th century George and Dragon Inn in High Street on Geo-graph, taken in April, 2012. Edward JOHNSON, above, was born in Billingborough, LIN, circa 1836. His mother, Sarah, was born in France. Buckminster Hall was the residence of Lieut.-Col Albert De BURTON in 1900. The village also had "Old Hall", which was a large mansion in the Tudor style. This was divided into three residences by 1930. The national grid reference is TF 1134. You'll want an Ordnance Survey Explorer map, which has 2.5 inches to the mile scale. In 1912 Lieut.-Col. Albert De BARTON resided in the parish in Buckminster Hall. The last name is rendered as "de BURTON" in the 1881 census. He was born in London, but was a Captain in the Royal South Lincolnshire Militia in 1881 with three adult children born in Lincolnshire. In the churchyard there is one gravestone for a WWI casualty and two for WWII. See the Traces of War website. For a photograph of the Billingborough War Memorial and the names on the plaques in the church, see the Roll of Honour site. Michael Peck advises: "The WW2 memorial at St Andrews Church, Billingborough has been recorded. It shows no numbers, ranks or arms of service. Names recorded are:"
To Sgt Ralph H Credland Royal Air Force VR died 28 Jan 1942. To Leslie Grosvenor Hodgkinson Royal Field Artillery, eldest son of Charles Grosvenor Hodgkinson and Mary. Born St Andrews Day 1893 and killed in action near Ypres 1917 (no actual date mentioned), aged 23. Hodgkinson Leslie G - Killed 28/07/1917 (three days prior to 3rd Ypres. He was a gunner in 'B' Battery, 58th Brigade RFA service no 20981. Winckley Charles R - 15th Bn Sherwood Foresters, The address for his parents is given as Leamington, Warwickshire. R. CHRISTIAN, priv., Durham Light Inf., died 22 Nov. 1918, son of Elizabeth CHRISTIAN, Kirkby Underwood. Cyril Arthur BRYANT, srgt., 9 Sqdn. RAF, 24, died 30 Oct. 1939. Roy Hardy FREEMAN, ldg. airman, RN (HMS Nightjar), died 23 Oct. 1943, son of William Hardy and Charloote Lilian FRREMAN, Billingborough. In the 1086 Domesday Book, the village name is rendered as Billingeburg, from the Old English Bill+inga+burh meaning "stronghold of the followers of Bill". This place was an ancient parish in the county of Lincoln and became a modern Civil Parish when those were established. You may contact the Billingborough Parish Council regarding civic or political issues, but they are NOT staffed to assist you with family history searches. The Charities for the poor amounted to £41 per year in 1900. There are stone tablets in the church which record several gifts for the Charities. After the 1834 Poor Law Amendment Act reforms, the parish became part of the Bourne Poor Law Union. The parish grew quickly in the 1800s. With the coming of the railroads around 1845, the population soared. A Council School was built here in 1876 to hold up to 400 children.